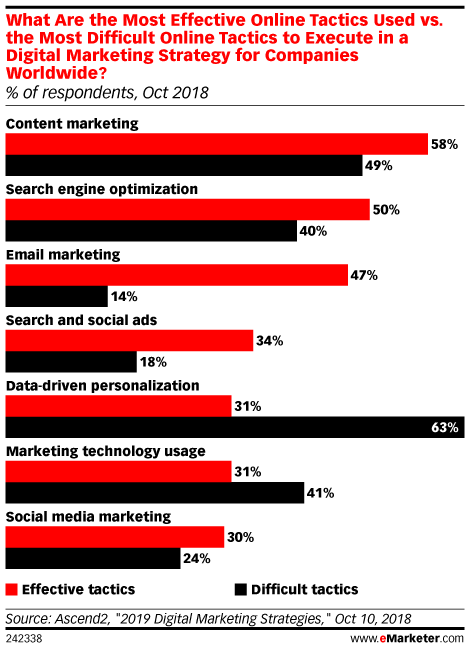 Data is from the October 2018 Ascend2 report titled "2019 Digital Marketing Strategies." 190 marketing influencers worldwide were surveyed online during the week of October 1, 2018. Respondents identified their role as nonmanagement professional (15%), owner/partner/CxO (34%) and VP/director/manager (51%). Respondents identified their company type as B2B (58%), B2C (19%) and equally split between B2B and B2C (23%). Respondents identified the number of employees at their company as fewer than 50 (42%), 50-500 (32%) and more than 500 (26%).